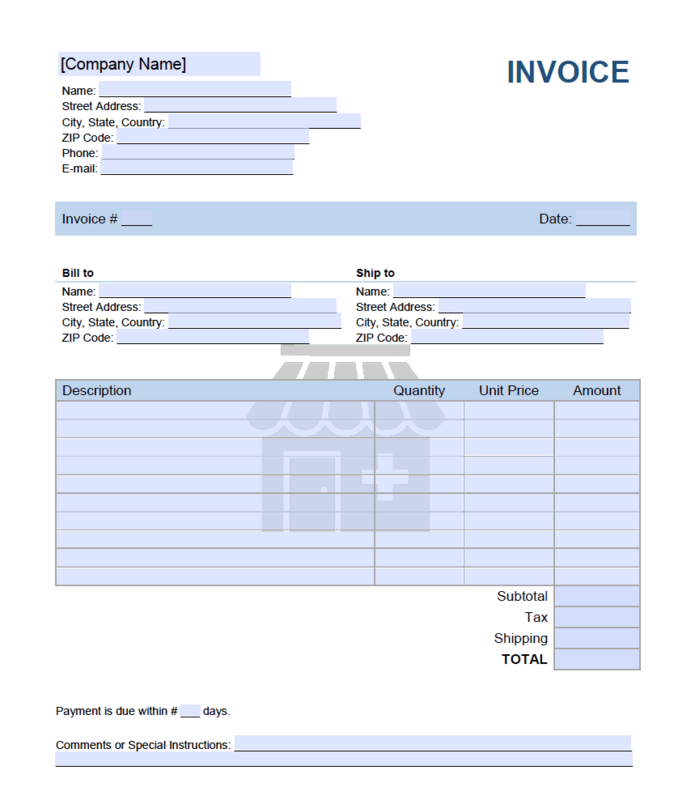 The pharmacy invoice is used to bill a patient for a prescription filled on a per pill basis. The total amount payable to the pharmacy also depends on the patient’s health insurance. If he or she has no insurance or a co-payment, the patient will be required to pay the amount at the time of pickup. If the patient’s health insurance covers the full cost of the prescription, then the invoice shall serve as a receipt with no payment owed. The pharmacy should distribute the medications only after the invoice has been paid. Several fields at the top left of the page will call for a clear identification of the Pharmacy Company generating this Invoice. Notice that each of these fields will be labeled. Begin by replacing the bracketed term “Company Name” with the Legal Name of the Pharmacy Company. Now, input the Building Number, Street Name, and Unit Number of the Pharmacy’s “Street Address” on the next blank line. In addition to the Street Address above, record the City, State, and Country of the Pharmacy’s Address to the third blank line. Finally, the Pharmacy’s “Zip Code” should be produced on the fourth blank line in this section. This will complete the Billing Address information for the Pharmacy. Now we will move on to more immediate forms of contact. The Pharmacy’s Business Telephone Number must also be reported (as a convenience) for the Customer seeking to discuss the services provided. Supply this to the fifth blank line. Next, we will need the Pharmacy’s official Business “E-Mail” Address on the last blank space in this heading area. The Pharmacy Customer’s information must be fully reported on this paperwork. Two columns have been presented here for this purpose – each with a labeled set of lines calling for a component of the Pharmacy Customer’s Name and Address. The column on the left with the title “Bill To” requires that you produce the Mailing Address where this Pharmacy Invoice is being sent. You will have to use this column to give the Recipient Name and Billing Address. Sometimes, the Pharmacy Customer will have a different Address where shipments are received. This Shipping Address of the Pharmacy Customer must be recorded under “Ship To” if it differs from the Billing Address. The Pharmacy Customer will need to see an account of what he or she has ordered and what the costs of these items and/or services are. To this end, a simple table designed to deliver this information in an organized manner has been included. Begin satisfying the table by entering a “Description” of the ordered medication(s) and/or other items to the first column. 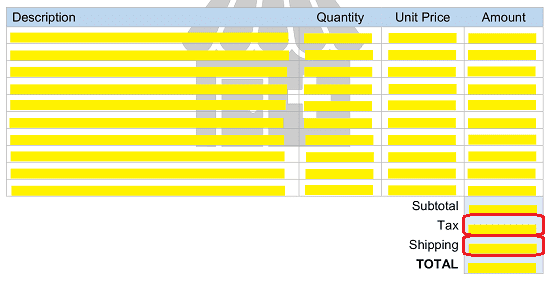 The total number of items the Pharmacy Customer ordered will need to be reported in the second column under “Quantity.” This should be followed with how much just one of these items ordered costs produced in the “Unit Price” column. 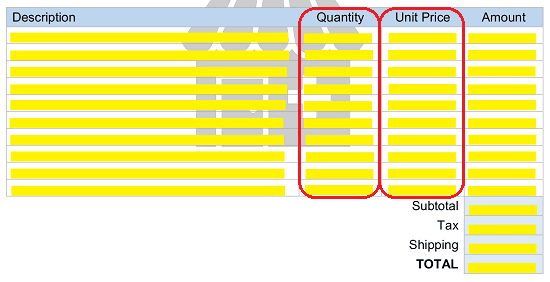 Both “Tax” and “Shipping” fees that apply to the Pharmacy Customer’s order should be presented using the next two fields. 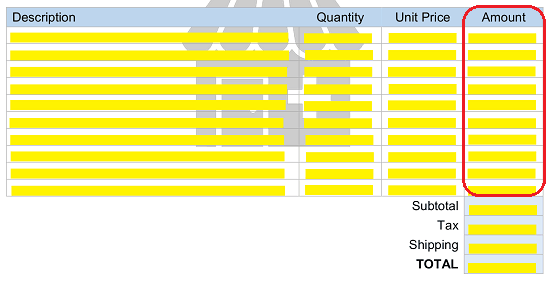 Enter the summed “Total” of the “Subtotal” field plus the “Tax” field plus the “Shipping” field in the last box. In many cases, some additional information pertaining to this Invoice and its contents will need to be given to the Pharmacy Customer. The statement “Payment Is Due…” will give you an opportunity to tell the Pharmacy Customer how many days after receiving this paperwork may elapse before a payment is considered delinquent or late. The “Comments And Special Instructions” area will enable you to deliver any pertinent information not delivered above. This paperwork can be downloaded with the MS Excel button above. Gather the information defining the transaction you are billing the Pharmacy Client for then open this file with a compatible spreadsheet program. Cells A1 through A8 have been reserved strictly for the Pharmacy Information used to identify the vendor issuing this Pharmacy Invoice. Begin by supplying the Pharmacy Logo and Company Name to cells A1 and A2 accordingly. Make sure to furnish the “Name” of either the attending Pharmacist or an Employee of the Pharmacy to cell A3. Enter the Pharmacy “Street Address,” City, State, Country,” and “Zip Code” in cells A4, A5, And A6. Next, you will have to report the Pharmacy’s current Telephone Number and E-Mail Address in cells A7 and A8. The Pharmacy’s Reference Number for this transaction, otherwise known as the Invoice Number, must be recorded here as well. 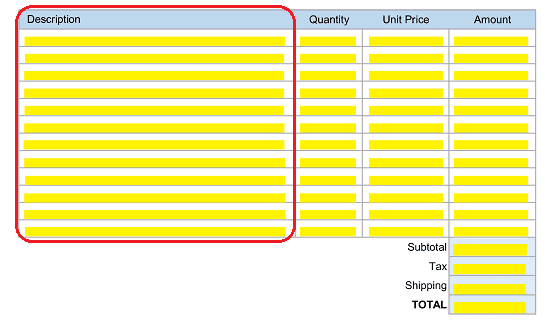 Document the Invoice Number in cell F4 and the Invoice Date in cell H4. 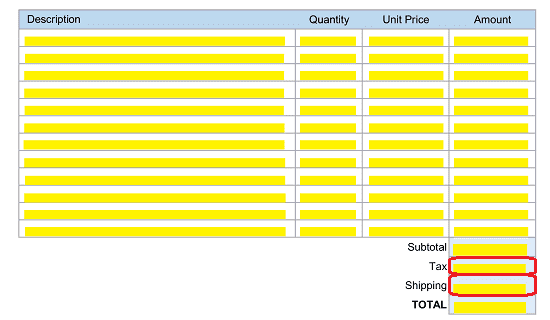 The Pharmacy Order will need to be included in this Invoice, so the Customer can verify and pay for these charges. We will use the table beginning in row 16 to complete this task. Notice that four columns are presented here. 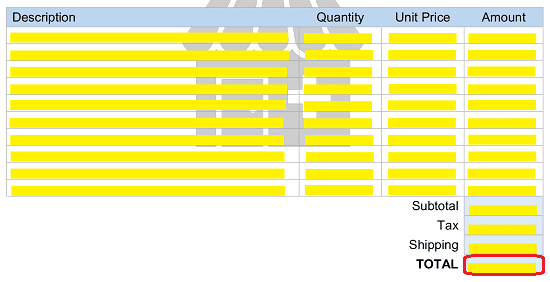 Utilize the “Description” column (A) to give an account of the items making up this Pharmacy Order. 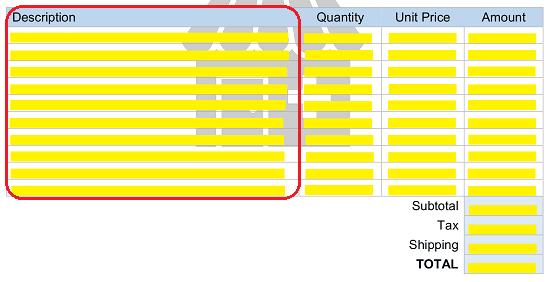 Next, provide the number of items ordered in column F (“Quantity”) as well as the “Unit Price” of every item in column G. The “Amount” column will automatically generate the appropriate dollar value for each item the Customer ordered. 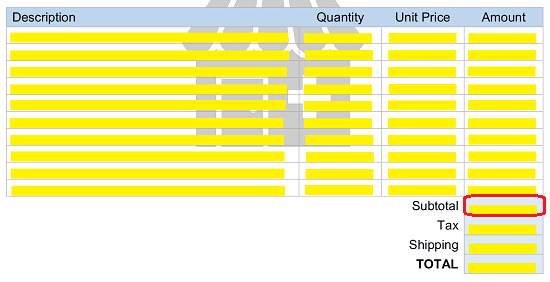 In addition to the dollar amount of each item ordered, column H will also supply a sum of its contents in “Subtotal” then it will add this amount to the cells marked “Tax” and “Shipping” so a “Total can be presented to the Pharmacy Customer. 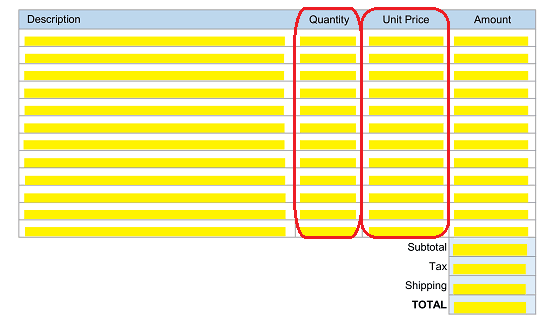 You must enter the appropriate “Tax” and “Shipping” Amounts to finalize this Invoice. It is usually considered sensible to place a time limit on when a payment will be considered on-time and when it would be considered late. We declare this period as a count of days beginning with the Date the Pharmacy Customer receives this Invoice. Enter this number of days to cell A33 by replacing the brackets in the statement it contains with this time limit. Addition information may be supplied at the discretion of the Pharmacy in cell A34.